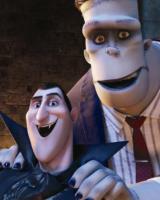 “Hotel Transylvania” – the record-setting 3D computer-animated monster comedy from Sony Pictures Animation that ranked as the biggest September opening in movie history and the best opening ever for the studio – is releasing a new animated short as a special Halloween treat. Beginning Oct. 26, all digital showings of “Hotel Transylvania” in Regal Entertainment Group Cinemas around the country will be preceded with a new traditionally animated short directed by the film’s director, 13-time Emmy nominee (and three-time Emmy winner) Genndy Tartakovsky (“Dexter’s Laboratory,” “Samurai Jack,” “Star Wars: Clone Wars”), who also animated every key frame of the new short. Entitled “Goodnight, Mr. Foot,” the short stars none other than the legendary monster Bigfoot, and follows his adventure as he, too, checks in to Dracula’s five-stake resort in search of a little R-and-R, only to find himself faced with an enthusiastic witch-maid, eager to make Mr. Foot’s stay a memorable one. To commemorate the debut of the animated short, an exclusive new collectible one-sheet — designed by Tartakovsky himself — will also be given away at all showings of “Hotel Transylvania” in Carmike Cinemas nationwide from Oct. 26 (while supplies last). “Hotel Transylvania” fans surfing the internet might just keep any eye out (not literally!) for a specially-created promo video popping up some time around Oct. 31 (date TBD). The feature film debut of Genndy Tartakovsky, Sony Pictures Animation’s “Hotel Transylvania” proved to be the biggest September opening for a film in U.S. history, and went on to open No. 1 in many territories around the world, including Argentina, Brazil, Bulgaria, Colombia, Ecuador, Malaysia, Mexico, Peru, Philippines, Romania, Russia, Slovenia, South Africa, and Sweden. “Hotel Transylvania” features the voices of Adam Sandler, Andy Samberg, Selena Gomez, Kevin James, Fran Drescher, Steve Buscemi, Molly Shannon, David Spade, and CeeLo Green.